April is a bit elastic in Leicester Square. I don't know if any red carpet events are scheduled for May, but if they are we'd better supply the stars with hard hats. 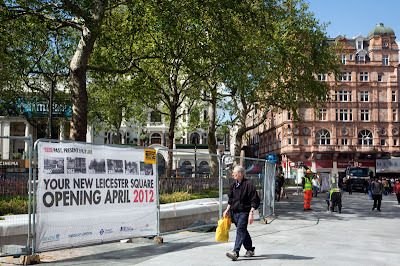 For those of you not familiar with Leicester Square, it is where the main movie theatres are and where all the premiers of new movies are held. The square has been in a process of refurbishment since 2010. I regret that I didn't visit this place because of refurbishment. But now I have one more reason to come to London again. A dingy, crowded place I always thought, never very attractive. The two million starlings in those trees didn't help! An upgrade has to be good, whenever it finishes. I wonder if it got sidelined by the Olympics construction. I saw Cry Freedom in Leicester Square and, on the way home, there were mice running under the tracks in Piccadilly Station! There's lots of building going on in London due to the Olympics. Are they going to make the looming deadline?